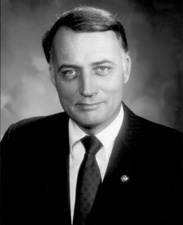 DURENBERGER, David Ferdinand, a Senator from Minnesota; born in St. Cloud, Stearns County, Minn., August 19, 1934; attended the public schools in Collegeville, Minn.; graduated, St. Johns Prep School, Collegeville, 1951; graduated, St. Johns University 1955 and University of Minnesota Law School 1959; admitted to the Minnesota bar in 1959 and commenced practice in St. Paul; served in the United States Army 1956-1963; elected in a special election on November 7, 1978, as a Republican to the United States Senate to complete the unexpired term of Hubert H. Humphrey ending January 3, 1983; reelected in 1982 and again in 1988 and served from November 8, 1978, to January 3, 1995; was not a candidate for reelection in 1994; chairman, Select Committee on Intelligence (Ninety-ninth Congress); denounced by the Senate in 1990 for unethical conduct; pleaded guilty in 1995 to charges of misuse of public funds while in office, and sentenced to one year of probation; senior counselor with APCO Associates, a consulting firm in the District of Columbia, 1995-. Durenberger, David F. Neither Madmen Nor Messiahs: A Policy of National Security for America. Minneapolis: Pirhana Press, 1984.